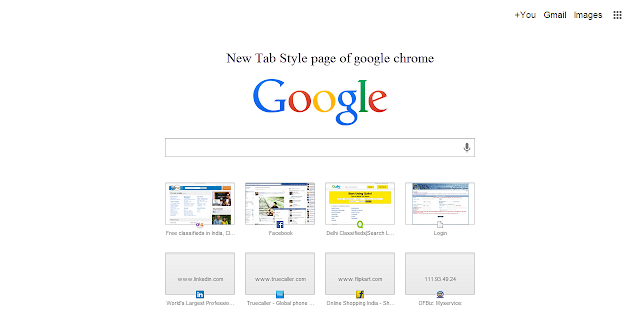 Google chrome updated to latest version , which includes many new features like New Tab page style for google chrome on which its include google search in the middle and all the most visited tabs below and newest feature which allow user to opened the recently closed tabs in google chrome .The New Tab feature of google chrome make google chrome to start slow , if you are on slow connection then it take some time to start a new tab page for very first time but you can speed up your google chrome by reverting back to your old style google chrome new tab page and you can also look at my post on how to speed up google chrome for very high speed .So in today we will see how to return or revert back yo our older style new tab page which only include all the most visited website in the center of the google chrome . 1) Opened Google Chrome and then in the location box type chrome://flags and then hit Enter , see below image. 2.) Now click CTRL+F , a search box will open on the right top of google chrome, in that box type Enable Instant extended API and move to that section. 3.) In that section there is drop down menu from that drop down menu choose the disable option and then restart your google chrome . 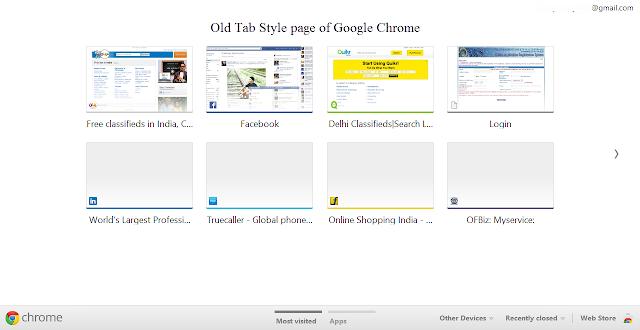 After restarting your google chrome browser you will see your old style new tab page in which you all visited website will be shown in the middle of the google chrome ,see below image . As you can seen in the above image we revert back to our old style new tab page on google chrome .I hope you like my this post , if you have any query please do leave comment and don’t forget to subscribe and follow my blog .